Hippeastrum Pyjama Party (Hippeastrum hybrid) is a beautiful single featuring reddish pink flowers with variable white stripes and a dainty picotee edging. For a spectacular floral display you simply cannot go past Hippeastrums. 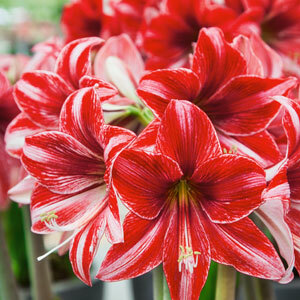 Also known as Amaryllis, these large spectacular trumpet shaped flowers are produced in Summer from bare bulbs, followed by strappy green foliage as the flowers are dying off. Hippeastrums are easy to grow in pots containers or in clumps as a garden display. Bulbs need to be planted with the top 1/3 of the bulb above the soil. Supplied as a dormant bulb. Availability: OUT OF STOCK/OUT OF SEASON! Available to order from mid-August to November, unless sold out. General Information: Produces spectacular trumpet shaped blooms in various colours. Watering: Weekly at the base of the bulbs, not into the foiliage or over the bulb nose. Overwatering will cause stem rot and red rust. Fertilising: Prepare soil with well-rotted animal manure. Pruning: After blooming the stem may be cut close to the bulb, leaving the leaves to grow on. Pests: Protect from snails. Can get leaf scorch due to a fungus so do not water on the leaves or nose of the plant. ✔ Ideal for Pots or as cut flowers. Tips: If planting in pots, allow 3–4 cm of soil around the bulb. Make sure that you have good drainage. Fertilise once flowered. Likes a sunny position so that the bulb can settle and grow to a good size. **Bulbs can be held for flowering later in the season by placing bulb in the crisper part of the fridge (about 5 degrees) in September to hold back the flower progression. Remove bulbs and pot up as per previous directions about 5 weeks before flowers are required and keep plants about 20-25 degrees in a reasonably bright position. Flower development can be slowed by placing into a cooler position, or hastened by placing into a warmer position. After flowering bulbs will continue with normal foliage development. **Bulbs grown in Hippeastrum vases need to be planted into soil or pots after flower has faded to complete the growth cycle. Bulb can be used again in the vase the following year.